Description: The drug has pronounced Anabolic and Androgenic effects are less pronounced. Is used for the recruitment of those muscles, giving relief, the Elimination of the deficit of proteins in the long term. In combination with drugs such as oxandrolone (by weight), Mezoral, Finarex. It is not suitable for the preparation for a competition. 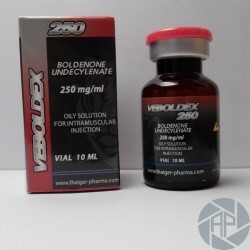 During the administration of the drug increases the appetite, but not is concerned, can eat what want, during the Veboldex 250 course, since contributes to the Division effective of them proteins. The dose is 200 to 400 mg per week. Boldenone undecylenate mean dose of 250 mg. Injections is performed in one day. Detected during a maximum of 4 months. Not recommended for the female body (unless you have selected the athlete insisted on its admission and no individual susceptibility), but in some cases, the dose calculated by the instructions or the doctor's recommendation. Do not increase or double the dose of the drug, and use of the course. The concentration in the blood reaches a maximum after 1-2 hours and lasts 3 hours. Rapidly excreted by the body, which has a positive effect on the liver and kidneys. If you are a novice, you should start with small doses, watching the reaction of the organism. Not is recommended to take in the sensitivity individual to the drug or contraindications. In the majority of cases, there were side effects, but they are not subject to these regulations or take the drug for a particular course, both men and women may appear some side effects. Among them are: the fall of hair, the growth of hair on the face and body, aggression, increased hostility, disorders of the gastrointestinal (vomiting, flatulence), yellowing and urine of Brown, pain when urinating, increased body temperature. Hypertension, an amount of delay in body fluids, thereby toxic effects in the kidney. As this toxic effect on the liver, cardiovascular system. Can cause rashes skin, acne in the body (in the case of overdose).